Always hovering in the background is his (not so original) view that history is progressive and something is gradually unfolding and developing as we move from ancient cultures (India, Greece, never China) to Islam to modern Europe. In this great drama, the “spirit of Islam” is essentially anti-classical and empiricist and it is Islam that created the foundations of modern science by introducing this attitude into humanity (“European culture, on its intellectual side, is only a further development of some of the most important phases of the culture of Islam”). 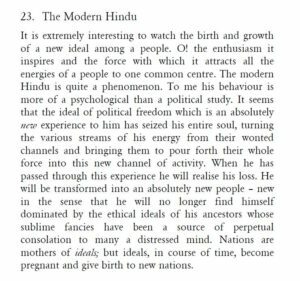 This basically Hegelian view of history was all the rage in the circles that Allama Iqbal frequented (its echoes survive to this day), and if this is still your cup of tea, jump right in, Iqbal will not disappoint you. 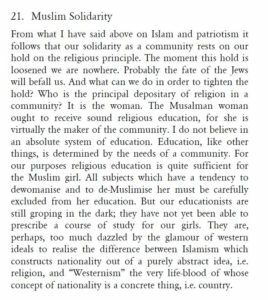 Historical references are cherry picked and whatever theory he is proposing is supported by quranic verses that other Muslims may nor may not interpret the way Iqbal does. Sometimes the cherry-picking stretches credulity and even fans may become a bit suspicious; for example, defending the unequal shares of men and women in Quranic inheritance law he says “From the inequality of their legal shares it must not be supposed that the rule assumes the superiority of males over females. Such an assumption would be contrary to the spirit of Islam. The Qur’an says: And for women are rights over men similar to those for men over women’ (2:228). This is rather disingenuous, because the quoted verse in context is not about equality at all, but specifically about the superiority of men over women. Here is Yusuf Ali’s translation of the entire verse: Divorced women shall wait concerning themselves for three monthly periods. Nor is it lawful for them to hide what Allah Hath created in their wombs, if they have faith in Allah and the Last Day. And their husbands have the better right to take them back in that period, if they wish for reconciliation. And women shall have rights similar to the rights against them, according to what is equitable; but men have a degree (of advantage) over them. And Allah is Exalted in Power, Wise. The book quotes heavily from contemporary European intellectuals (someone has calculated that 25 of the 34 Western philosophers mentioned in it are contemporaries, some of whom are already fading into obscurity, but were prominent in the day); if the metaphysical speculations of early 20th century Western philosophers (Bergson, Whitehead, Carr, Spengler, etc.) appeal to you, go for it. 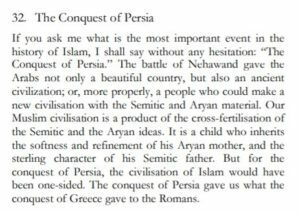 You will learn that much of this speculation was already present in the Islamicate tradition, or so Iqbal claims. I don’t doubt that some of what he is saying is perfectly true, but given the way he creatively cherry-picks and interprets the Quran, I have my doubts about some of his interpretations of Muslim philosophers as well. But I don’t know enough about the subject to know for sure. Now that almost a century has passed (some of the lectures are revised versions of essays he was working on in the early 1920s) we can also ask, what influence has the book had? It seems to me that it continues to appeal to modern (semi-westernized) Muslims (especially in Pakistan) because it seems to offer the possibility of radical reform of Islamic law and creative (modern) reinterpretation of Islamic theology, the appeal is almost entirely symbolic; most of his fans don’t actually read the book, they just like the fact that it is there and that they have heard it is modern and all about creativity and freedom and how we had all this before the West ever thought of it. 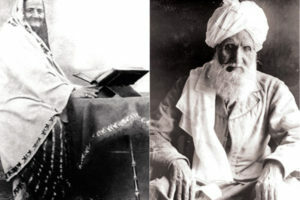 It is my impression that the detailed ideas had more appeal then, when this kind of reinterpretation and the “catch up with the West because we were actually there first” theme was commonplace in places like Aligarh, but since then the Islam that has risen to confront the West is good old classical Islam, Magian crust and all. “The task before the modern Muslim is, therefore, immense. He has to re-think the whole system of Islam without completely breaking with the past”. Incidentally, recently a pakhtoon mullah who was said to be “anti-extremist” was killed in Kandahar after his work was described as anti-Islam by traditional mullahs.. The application of Iqbalian ideas to the real world will run up against blasphemy and apostasy memes..
What are Allama Iqbal’s thoughts on Sufism, Pirs, Fatimah and Shia Imams? His lectures have been a contested item in his legacy, with ‘modernist Muslims’ like his own son using them as a tool to portray him as being moderate while the orthodox lobby prefers his poetry over his ‘philosophy’. This paradigm has been challenged by a few scholars, most recently by Suheyl Umar, director of Iqbal Academy in Lahore (titled: Paradigm of Reconciliation: Iqbal’s Methodology in his “Reconstruction” ). It was published in Urdu and in an eviscerating review, Ajmal Kamal did what he does best. I’ll try finding links to both the original and AK’s review. Allama Iqbal was a great poet. I’m not so sure about his status as a philosopher. Something clearly happened to him while he was studying in Europe to make the author of “Saray Jahan say acha Hindustan hamara/ Hum bulbulain hain iski, yeh gulistan hamara” write something like “Chin-o-Arab hamara, Hindustan hamara/Muslim hain hum, sara jahan hamara”. I had a professor of Urdu at LUMS who insisted that Masjid-e-Qurtaba was the greatest poem ever written in Urdu. Like many “liberal” Pakistanis, in my family Faiz Sahab was a much bigger deal than the Allama. What is Iqbal’s influence on political thought in Pakistan? Allama Iqbal (we don’t even use his first name) is considered the spiritual father of Pakistan. He was the one who apparently convinced Jinnah that there was a need for a separate Muslim state. This was in the 30s before Iqbal’s death. He is the “national poet” of Pakistan (that’s what Wiki says). Iqbal Day used to be an official government holiday ( it’s his birth anniversary). I think now some provinces make it a working day. Universities are still usually off. It is a lot easier for the Pakistani state narrative to appropriate Allama Iqbal than it is to appropriate Faiz Sahab for example. Zilch. Iqbal was a woolly headed thinker. That is not true. 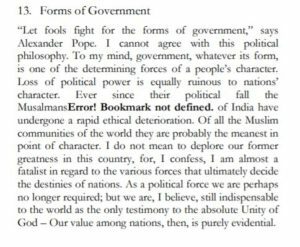 As I noted above, the Pakistani narrative (State Narrative) is heavily based on Allama Iqbal’s thoughts. See “Chin o Arab Hamara, Hindustan Hamara/ Muslim hain hum, sara jahan hamara” as just one example. “Chin o Arab Hamara, Hindustan Hamara/ Muslim hain hum, sara jahan hamara” – This kind of airy fairy thinking does not lead to productive Nation building or State building or any institution building or any development in science or industry or better relations between man and man , or man and woman or between nations. Slightly change the words to “Chin o Arab Hamara, Hindustan Hamara Pakistan hamara / Christian hain hum, sara jahan hamara” . How does it read? Slightly change the words to “Chin o Arab Hamara, Hindustan Hamara Pakistan hamara / American hain hum, sara jahan hamara” . How does it read? I was not endorsing Allama Iqbal’s thoughts. I was simply responding to the question posed by Raj regarding Iqbal’s influence on Pakistan. He is regarded as the spiritual father of the country and his birthday is a public holiday. It would be hard to argue that he does not have any influence in Pakistan. Iqbal was one of the guiding lights of the whole Muslim nationalist project. Whether you think that was a good or bad thing depends on which side of the aisle you are sitting on. The reconstruction in itself go away from the established path. It shows that Iqbal was not satisfied with the Teachings! That what he suggested is Humanity has reached a evolutionary developmement where He has no need of Divine guidance. In this scenario a refusal is necessitated from the prayers. Therefore Iqbal,s reconstruction does not match with the Islamic Teachings. And required to be condmned. Does not match indeed. Condemn in the strongest words. If i had more money i would etch “condemn” in diamond and throw it like shoaib bhai on iqbal’s grave. Not that shoaib bhai throws… I mean he bowls properly n all. But you know what I mean.. I also agree strongly with that arabic you have written in line there. Powerful! The review is too generalised. 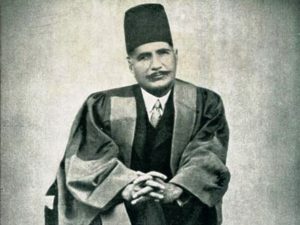 Iqbal had talked on some basic themes in Reconstruction of Religious Thought in Islam, including his idea of God, prophethood, afterlife, prayer and whether Ijtihad is open ended or bound by Islamic traditions and what form it can take. Any review of Reconstruction should deal with these topics separately and see what he has to say on each of these. He has rejected pan Islamism in Reconstruction. Whatever his shortcomings, the gist of his work is: he has retained a monistic idea of God, equating God with universe, but rejected all other so called pillars of Islam including prophethood, revelation, afterlife and return of a redeemer. Angels and hoors are scorned in his poetry. I don’t see what that has to do with Hegel. 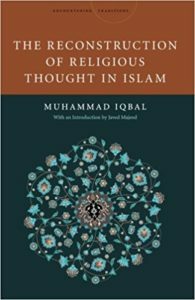 Iqbal hasn’t pretended it’s philosophy, it was Muslim religious reform that was central to his thought. The ideas all existed at his time but his radicalism was and is unsurpassed in the history of Urdu literature; besides, his expression, similes, metaphors, the melody and poetic quality of his poetry were all his own. Yes, Masjid-e-Qrataba is the most beautiful poem in Urdu, he was talking about a Muslim reformation in this poem, the kind that had taken the west by the storm. Good comment. Iqbal is a lot more complicated than this review makes out. The question of the most beautiful poem in Urdu is subjective. Some of us would argue that “Mujhse Pehli si Muhabbat” or “Dasht-e-Tanhai” are more beautiful. But we are all entitled to our viewpoints. Dewey came out with a book a bit earlier than these lectures called “Reconstruction in Philosophy”. Comparing the two texts does give a sense of the purposes of both authors. How do you confront a cultural inheritance of myth and transform it in light of modern scientific knowledge? How can you retain a sense of certainty in those inherited beliefs that serve a crucial social function? Dewey had a pragmatic answer, to not expect any absolutes. Iqbal on the other hand found it in mystical experience which he tries but fails to philosophically defend. His cherry picking is a consequence of the basis of his knowledge of God which is experience, not the Quran. I believe at one point he even reinterprets heaven and hell as states of his postulated Khudi. 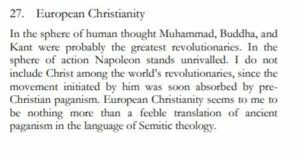 The book is primarily targeted at contemporary Muslims, who were keenly aware of their weakness vis-a-vis Europe, as well as of their historic role as a “worthy opponent” that at some point in the past held the upper hand against Western Christian competitors. Is there not a sleight of hand here? Not in your words, but in Iqbal’s intentions (which you are reporting). How do Indo-Muslims square the fact that the Muslims who really were worthy opponents of the Christian West, were a motley group of Arabs, Kurds, Persians and, much more importantly, Turks – cultures quite different from their own? Christian West, on the other hand, had enjoyed a relatively more cross-pollinated and standardized culture (even in pre-Christian period) thanks to Pax Romana and later Germanic Migration – which peppered Europe with Germanic tribals from Ukraine to Spain. So, it wasn’t altogether fantastical if Richard Cœur de Lion, a French-speaking Norman lord of England, came to the Levant with other Frankish knights to fight a Crusade. The local Mediterranean kingdoms were already ruled by an elite of Germanic extraction (like Lombards) and they all were quite Romanized. So the idea of a Christendom, at least in my naive understanding, was a far more secure cultural idea. And it is as easy for a Romanian as is for a Englishman or a Frenchman or a Spaniard to think that *their* cultural forebears fought the Muslims. Or maybe my understanding of history is mistaken? That Indian Muslims did indeed fight Christendom in equal measure and were part of a larger cultural whole for much longer than we give them credit for. I think it IS unreal, but I can also tell you what Allama would say in response: he would say that “Islam is a race-making religion” (he actually said that; I hope the “Islam is not a race” people don’t find out), so all who convert to Islam join this one race called Muslims. All the achievements (and tragedies) of this race are then common. We share in that “world beating” culture because we became part of it the day we (our forefathers) converted..